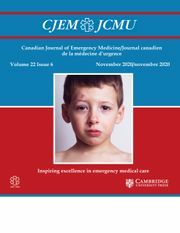 CJEM is Canada’s only academic journal in emergency medicine and the official publication of the Canadian Association of Emergency Physicians. CJEM publishes articles of interest to emergency care providers in rural, urban or academic settings that reflect the growing interest in emergency medicine, both as a medical discipline and an expanding field for research. Original research, review articles, updates, editorials, case reports and diagnostic challenges, plus position statements from the national association are widely read. Pourquoi mon bras est-il enflé?